From churches and charities to schools and sororities, many different organizations hold pledge drives, campaigns, and charity events in order to raise money for their cause. An appeal for funds can take many forms, but one popular way of bringing in proceeds is with fundraising events. Fundraising events are an effective way to reach many different people at once. 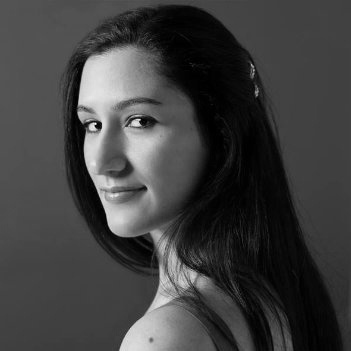 They’re usually aimed at bringing in money through ticket sales or generous donations, and involve promoting community involvement and increased awareness of the issue at hand. Some fun ideas for your special event may include silent auctions, fancy galas, cocktail receptions, competitive races, and outdoor festivals. Although fundraisers are meant to be a lot of fun and drive community involvement, they also require a lot of planning. In order to generate interest, you must consider your overall goals, target demographics, marketing plan, and specific ways to make your event stand out from the rest. It is important to go over the logistics of your event. Where will your event be held? What kind of dress code will be required of your guests? What is the itinerary for the event? Will food or alcohol be served? Will there be any entertainment? Will there be products to give away or prizes for top donors? When planning an event for your organization, consider some of these unique fundraising ideas for staging an event that will get people talking and bring money in the door. What is your greatest objective when it comes to your event? Of course you want to raise money, but is that the most important thing? Perhaps you want to increase community awareness of your company, or get more people to volunteer for your cause. Perhaps you’d like people to donate their old clothes, or encourage them to adopt a pet. Whether it’s action, awareness, or money, decide what your number one goal should be. From there, you can focus your actions even further. Do you want to raise $1,000, or $10,000? Do you hope to get five new volunteers signed up, or 50? Consider your organization’s brand, values, and overall mission to help clarify your fundraiser ideas as you move forward. Your target audience is the group of people you hope will attend your event. The more the merrier, of course, but think about whether you are aiming to reach a particular group. Your target audience may be based on a population’s age, experience, activity-level, or life goals. This will affect the type of message you send out, the venue you choose, the food you serve, and the way people interact at your event. What Type of Event Will You Have? After you consider your fundraising goals and your target audience, you can begin to think about what type of event you’ll have. In addition, start to assess your available budget, timeline, and resources (like volunteers and staff) to determine the most reasonable event for your organization. Live and silent auctions. Auctions are great ways to get people to bid on items they find valuable, driving up the amount of the donations through light hearted competition. Gala events. Gala events, like cocktail receptions, garden parties, and other festivities, attract VIP community members, key business stakeholders, upper-management types, and charitable souls looking forward to a night out. Galas are often more upscale events and sometimes include dining and dancing. Dinners and tastings. Fundraising events can also take the form of special dinners, tastings, wine pairings, or cocktail receptions, playing on the pleasures of food and drink to sell tickets and promote exclusive experiences. Outdoor activities. Walk-a-thons, dance-a-thons, and fun runs can gain a lot of traction with the active set, while picnics, sports tournaments, and street fairs appeal to all sorts. Marketing and event promotion helps get the word out about your upcoming festivities. Again, consider your audience and your budget. Will you create a website? Launch an email campaign? Create flyers or direct-mail? 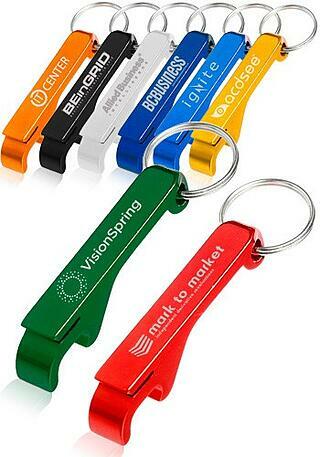 Give out promotional items? 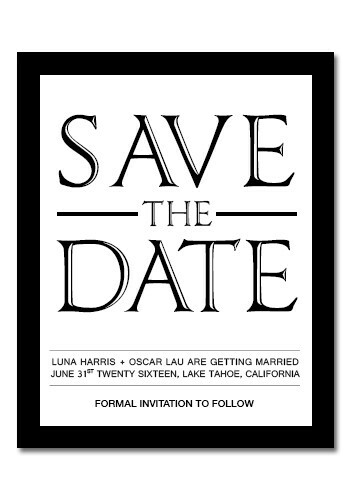 If you like the idea of handing out a physical promotional item to get people thinking about your event, consider sending personalized invitations in the mail, handing out promotional plastic pens at your school or church, or distributing promotional save the date magnets with your event date and other crucial information. Of course, a huge part of planning your fundraising event will come down to the affair itself. You’ll want to create a comfortable, enjoyable atmosphere where people can meet and mingle, learn more about your cause, and contribute their “time, talent, or treasure” in a way that works for them. Consider these ideas for keeping your audience happy, well-fed, and tuned in to your organization’s fundraising goals. Door prizes are great ways to welcome guests and make them feel special and appreciated as soon as they arrive at your event. Consider small and lightweight items that guests will be able to carry around, such as branded pens and small custom notebooks to jot down thoughts and inspiration. Attractive personalized metal keychains are great handouts and easily for guests to attach to their car keys. Bottle opener keychains are especially handy for beer-tasting events or cocktail receptions. Food and drink are always great incentives. Food can help people gather around a common interest and encourage mingling while satiating their appetites. Providing food can even help you comply with local liquor laws, depending on your location and event structure. When it comes to customizing the dining experience, consider your venue, event style, and anticipated size. A central champagne fountain or elaborate dessert table can supercharge excitement and participation at a gala event. Depending on your budget, you could give away personalized champagne glasses as favors, etched with your organization’s title or event name. If you’re hosting a dinner event or wine tasting, set an elegant table by placing personalized wine glasses at each setting and encouraging guests to take them home after the night is through. At outdoor events with foods like barbecue recipes or burgers, you may serve canned or bottled beer from a bar. 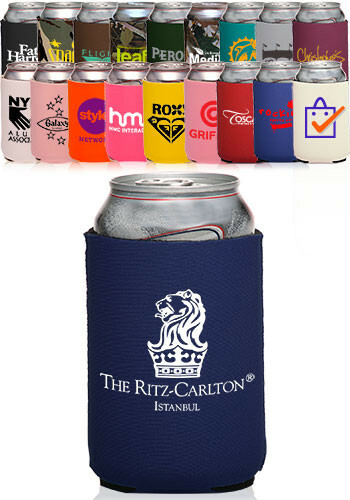 Consider custom koozies with your event logo or company colors branded on the sides to complete the look. Guests will appreciate these in warmer temperatures, and they’ll remember your organization when they use them in the future. During your event, take time to recognize the people who helped you along the way. For example, you might choose to honor top donors, community leaders, or outstanding volunteers with a good word or prize for their contributions. 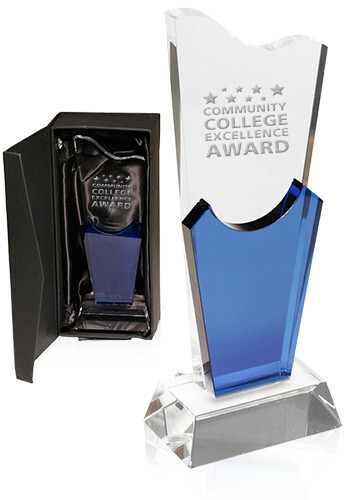 Glass awards and recognition crystals are sure to convey your appreciation and reward their hard work or dedication. You may even choose to create special prizes depending on donation levels. For instance, guests who donate $100 or more get custom-embroidered baseball caps, while people who contribute $500 or more receive custom leather laptop bags. These types of prizes create distinct incentives for events structured around donation. Another easy fundraising idea to bring in donations during your event is to sell items on-site. For instance, selling custom wristbands is a nice way for guests to show their support for a school, charity, or disease prevention cause. 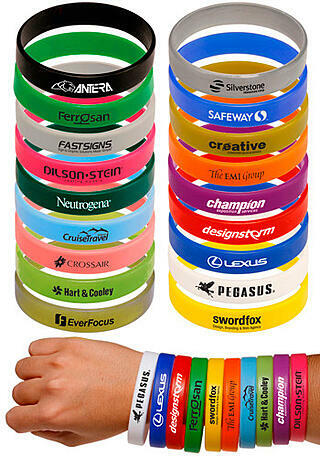 Swirl color wristbands or glow in the dark bracelets are fitting for Halloween or disco-themed events, or anything centered around children’s charities. The fundraising opportunity doesn’t have to end when the event is over. Consider giving guests parting gifts to remember the event and thank them for attending. Personalized tote bags are great ways to give a custom gift bag stuffed with paper handouts or fact-sheets (better yet, put this information on branded USB flash drives) or other tokens of appreciation like gourmet candy bars or quality customized metal pens. Planning a fundraising event can be hard work, and it’s important to have your goals in place before you begin. Take time to think about your most important objectives, as well as your budget and the type of event you want to have. Then, it’s time to go about staging the event with the proper food, décor, promotional items, and giveaways that wow your guests and solidify your cause at the top of their minds.